This thread results directly from the Swiss tech tree made by anodjl (in French), since two Swiss artilleries are in fact American ones. In order to identify their positions in the Swiss tech tree, it was naturally needed to see which position they could have in an American branch. Nowadays, the current US artillery branch is classified as a “heavy” branch, starting from tier VII, and based on medium tanks obviously linked to the Second World War. The proposed branch, linked in a way to the Swiss one, is classified as “light”, so in other words, based on light tanks, new light projects and even some air-transportable ones which are, if we except the first two ones, post-WW2 vehicles. All the presented vehicles have been built for real (so there are no never-left prototype/blueprint stage cases), and there are still some left in museums, military bases, arsenals… when they aren’t still in service. As a result, we would have two US artillery branches, with clearly opposed characteristics, and their own gameplay compared to the other artillery branches from the game. In addition, all of these proposals are dating from before the end of 1969, which is a kind of time limit for WoT. 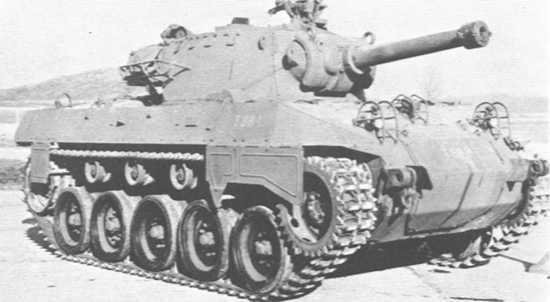 At the end of WW2, the US artilleries based on light tanks were based on the M24 Chaffee light tank : the M37 (currently tier IV), as well as the M41 (currently tier V). The army then requested new artilleries which had to provide a better crew protection (as in, having a roof). This led to the development of two vehicles, the T98 (105 mm) as well as the T99 (155 mm), based on the newly-built T37/T41 light tanks. However, only the T99 went through development. 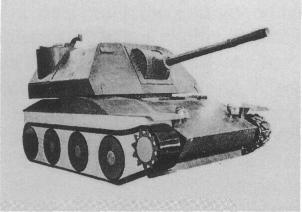 After tests, the T41E1 chassis was chosen and some modifications sneaked into the project. 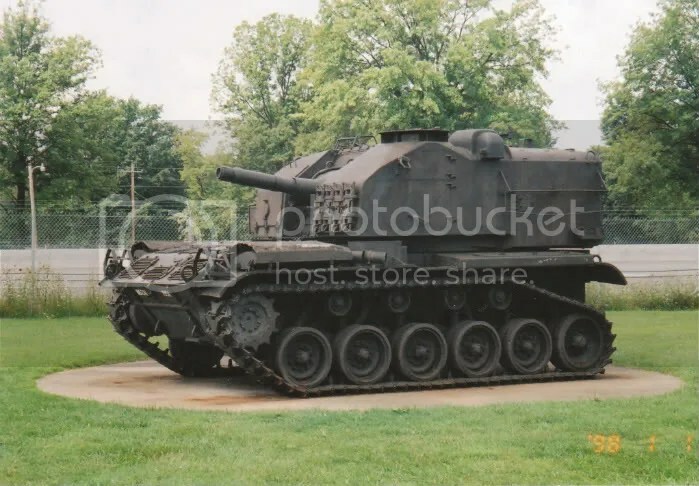 A roofless version of the T99 was made (the T97 was considered unsatisfactory, the roof was deleted because of the shells’ smoke which was obviously annoying for the crew), named T194 and later standardized as M44 (currently in the game as tier VI). Since 250 tanks were built already with a roof, they’ve been modified and had their roof removed later on. From the M44, the T98 finally saw its development. 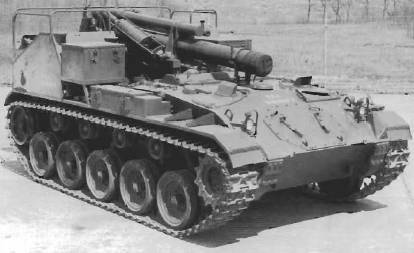 It basically became a M44 with a closed turret, with a 120° rotation angle (60° on each side), and equipped with a 105 mm Howitzer T96E1 gun (standardized as 105 mm M49 Howitzer). After many little changes, the T98E1 saw the day of light as M52. Later on, many projects saw birth during the Questionmark Conferences II to IV (from September 1952 until June 1954). In September 1953, the launch of a lightweight 110 mm artillery project took place, named T195, followed in May 1954 by the T196 and its 156 mm gun, still in the same lightweight category. Both are equipped with 360° rotating turrets. As you could imagine, the guns quickly got changed to respectively 105 mm and 155 mm guns (it’s more logical than to use ammunition of a completely atypical caliber). “Light” implies an estimated weight of 17,5 tons for the T195 and 22,7 tons for the T196 (for comparison, the M44 weighs 29 tons in combat). After the exact needs were clear, the conclusion arrived: both artilleries could be designed on the same technical basis. Between mid-1958 and late 1959, the construction of the prototypes occured. After testing and many small changes to care about the suspension’ problems, the production of the T195E1 and T196E1 followed, and then new T195E1 and T196E1 (TN : yes, same names) because of, again, suspension problems. Once this little matter was gone, the T195E1 and T196E1 were accepted for limited production in December 1961, and accepted for standardization in July 1963 as M108 and M109. Gradually, as time passes, many versions saw birth for the M109 (the current is the M109A7). The 155 mm Howitzer M126 will be replaced by the 155 mm Howitzer M185, more powerful, in order to shoot farther than the M44A1‘s maximum range of 14.500 m (TN : almost 9 miles exactly). This version will be named M109E1 in April 1969, later on standardized in October 1970 as M109A1. Every M109 built will be converted to the M109A1 standard in 1972. The M109A2 version is characterized by small improvements there and there, with the main one being the ammunition storage at the rear of the turret : it was slightly enlarged, in order to receive more shells (TN : to send more freedom on the enemies !). The M109A1 which got updated to the M109A2 standard got named M109A3. We’ll stop there about the M109, since the A2 standard is adopted by the US Army between 1976 and 1985 and that the A3 standard will be used later to test many improvements. The M109 as well as its derivatives are still in service in many countries (such as Libya and Turkey), including the M109 and M109A1, showing the scalability, efficiency and success of this vehicle. The gun is mounted on a turret at the rear, with a 60° horizontal firing arc (30° on each side) and an elevation of 65°. The 155 mm gun is quickly abandoned. The T235E1 and T236E1 (equipped with General Motors 8V71T engines) are standardized as 175 mm self-propelled gun M107 and 8-inch self-propelled howitzer M110. In 1969, the M110 is equipped with the 8-inch Howitzer M201, which was longer, and so, allowed to shoot farther, also creating the A1 standard, so this is how the M110A1 is born. These vehicles were quite used during the Vietnam War until the Gulf War, but they have been removed since from active duty in the US because the 155 mm (including the M109) are doing well too in terms of firepower and range of fire. The M110A2 standard is still in service in about a dozen countries. The US light arty branch in World of Tanks ? 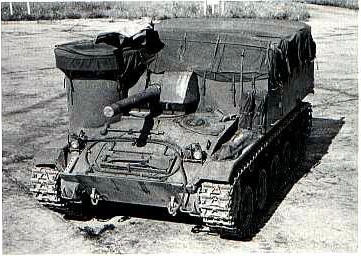 Neither the 57 mm Gun M1 nor 3-inch AT Gun M7 were developed for the M8A1. So there were 2 different guns : the 75 mm Howitzer M2 and the 75 mm Howitzer M3, with both very good vertical elevations : -20°/+40°. The other characteristics would be the same as the M8A1. 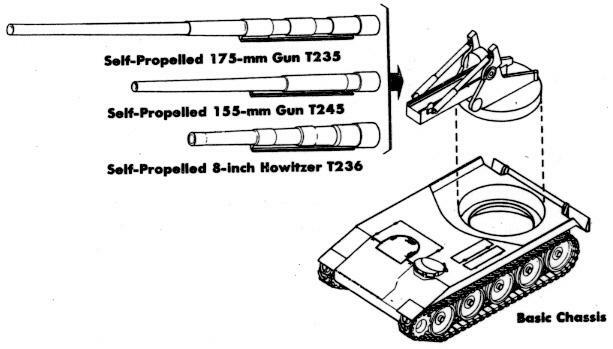 As anodjl reminded this proposal’s author (in French), there exists an artillery, modelled already but never integrated into the game, despite fitting naturally into this branch : the T88 HMC, as tier V.
Same modules as the M18 Hellcat, 2 suspensions (T88 and T88E1), and crew of 5. 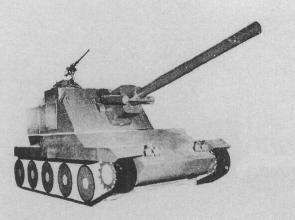 At tier VI would be the M52 (derivative from the M44 but with a turret and a 105 mm gun instead of the 155 mm one). At tier VII would logically be the M108 because of the 105 mm gun it carries. However, here comes trouble with the M109 : both the M108 and M109 are visually identical if we except the gun as well as what’s on the rear of many artilleries in the game to absorb the recoil (TN : for harvesting suicidal tomatoes). So the tier difference would only result with these two facts (and because of the difference of firepower, many M108 were converted to M109). At tier VIII would be the M109, characterized by its 155 mm guns : first the 155 mm Howitzer T186E1, then the 155 mm Howitzer T255 and finally the 155 mm Howitzer T255E4 (also called 155 mm Howitzer M126). In other words, the M109 will be interesting only if the stock version is the M109 and the full version the M109A1. 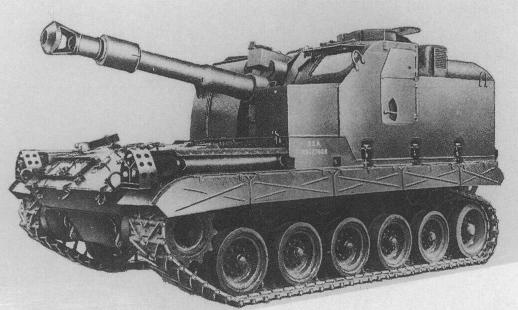 At tier IX would lay the 175 mm self-propelled gun M107. Both the tier IX and tier X are almost identical, but the tier X will get 8 inch guns while the tier IX inherits from the T245‘s 155 mm gun in addition to its 175 mm gun. 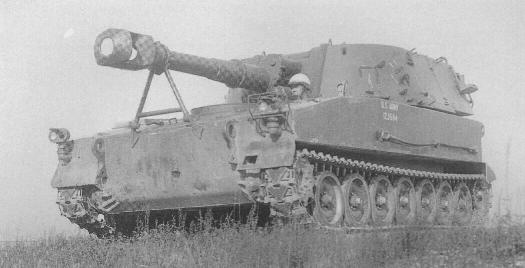 And finally, the tier 10 : the 8 inch self-propelled howitzer M110. 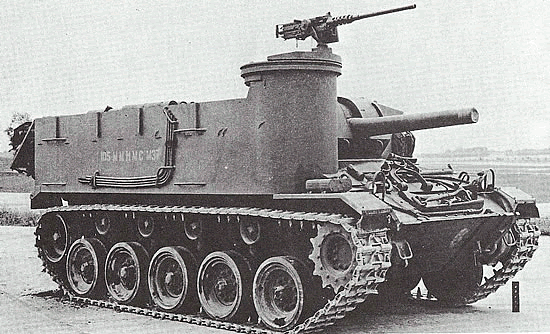 Basically a boosted version of the tier IX but visually identical, excepting the gun of course. Nice. I’ll probably do a new American heacy or medium branch for my next proposal. Reminder to myself: add this to the History tab. No, this was a task I made for my co-admins, they have to post your nudes. Seems like a neat little branch, but I’d rather wait for WG to “fix” artillery before introducing any new ones. Otherwise, it’s a little pointless IMO. Anything that is not the piece of RNG crap T92 I am happy. This is cool! 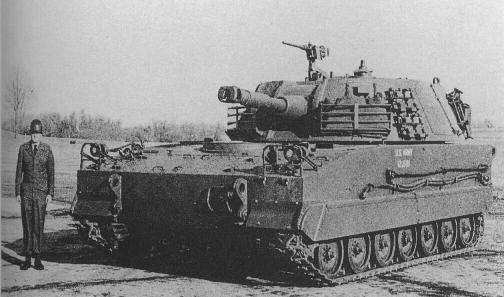 But we could have the A1 standards for them aswell… For example, The M109 could have a turret named “M109A2”, making the tank have a bit more HP ( +50 I mean) and the historical ammo capacity for the enlarged boom-boom-crate. I made a translation for the English section of the WG forum, that I allowed Ck16 to post it on the US WG forum. I’m glad that feedbacks of TAP readers are much more positive than on the WG forums where arty-haters polluted the threads without even reading it ! For the M109, I did not wanted to included the standard M109A2 in the tree as being too recent. The standard M109A1 was already from end 1969, the unofficial limit of WoT. The question of this branch as i said is strongly linked to the Swiss SPG branch, which includes both M109 and M109 KAWEST. I needed to solve the position of the M109 in a US branch to place it in the Swiss tree (also as tier 8). The KAWEST has so many improvements that i placed it as tier 10, alongside with the Panzerkanone 68.